Assisted dying is one of the key ethical and political issues of our day. Checking out of the Hotel Euthanasia is a novel that tackles the dilemmas head-on with a rare mixture of scabrous enthusiasm and due respect. The book is guaranteed to offend many; to help many come to a considered view of the complex issues involved around the topic; and to amuse as well as instruct many by the satirical approach used to engage with the topic. But one thing Ringwood can guarantee is that this amazing novel will leave no-one indifferent. 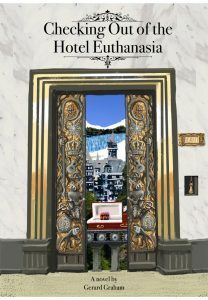 Euthanasia– whether you’re for or against assisted suicide, Gerard Graham welcomes you through the splendid doors of Hotel Euthanasia for a life changing stay. We just can’t promise you won’t die of laughter before it’s time to leave. Graham takes us 21 years into the future to tell the bizarre tales of the guests that come for the most luxurious death that money can buy, 100% personalised to the customer’s self indulgent desires– however weird those may be. Graham’s satirical comedy has been skilfully written, following Rab Lennon and his Glasgow cronies on their adventure to blow up Hotel Euthanasia in revenge for the assisted killing of his parents. However, along the way we find ourselves tripping over deep-rooted views, bumping into uneasy feelings and finding ourselves lost along the winding path of reality. You may just find yourself turning down an unexpected route.